Own the Iron Man II Movie Masterpiece Diecast Series Whiplash Mark II! This new offering is like no other. Here’s the Hot Toys Movie Masterpiece Diecast Series Sixth Scale Whiplash Mark II from the Iron Man 2 film experience. And if that title isn’t enough to floor you, wait until you get an eyeful of this 13-inch figure’s best features! The diecast format makes him more realistic than ever, especially considering that he’s designed in the likeness of actor Mickey Rourke as Whiplash Mark II. An interchangeable helmeted head with LED light-up eyes as well as a distressed metallic exterior bring Whiplash to life. He comes complete with whip weapons that also boast LED light-up functions. The Whiplash Mark II is truly a feat of figure design, so go ahead and make him the centrepiece of your collection! Now watch me Nae Nae. Now watch me Whiplash. Watch out for the Hot Toys Iron Man Mark XLIII Sixth Scale Movie Masterpiece Die Cast! This Avengers: Age of Ultron release is nothing short of a masterpiece. We are very excited to be carrying the Hot Toys Iron Man Mark XLIII Sixth Scale Movie Masterpiece Die Cast figure. Check out the rich color of his armor and the incredible detailing in every piece that combines to form the most realistic 12-inch rendering of Iron Man. The most novel installment in the MMS Diecast Series stays as accurate as possible to the on-screen aesthetic of Robert Downey Jr. as Tony Stark/Mark XLIII. Featuring a newly painted head sculpt, weathering effects on the die-cast armor for a dose of realism, LED light-up functions and a special diorama base with a damaged Ultron Mark I, this is one stunning piece that your collection needs now. CmdStore is coming for you this weekend, Ottawa! Fewer things inspire such a hallowed combination of anticipation, excitement and devotion in the hearts of geeks everywhere than convention season. Costumes are prepared, cameras are pulled out and inventories of personal toy stashes are taken in preparation for what could be called a spiritual holiday for some of us. That’s why we’re getting pretty stoked to head over to the Ottawa Comiccon this week, and naturally we don’t want you to miss out on the thrill of it all! The spectacle will take place at Ottawa’s EY Centre from May 8 to 10, and like every other proud gathering of nerds and pop-culture enthusiasts of all kinds, it will feature vendors’ tables and cosplayers of every persuasion imaginable. And of course, there’s no leaving out the featured guests that some of you might have been waiting a lifetime to be able to behold in the flesh. Allison Mack, known for playing Chloe Sullivan on Smallville, will be in attendance. 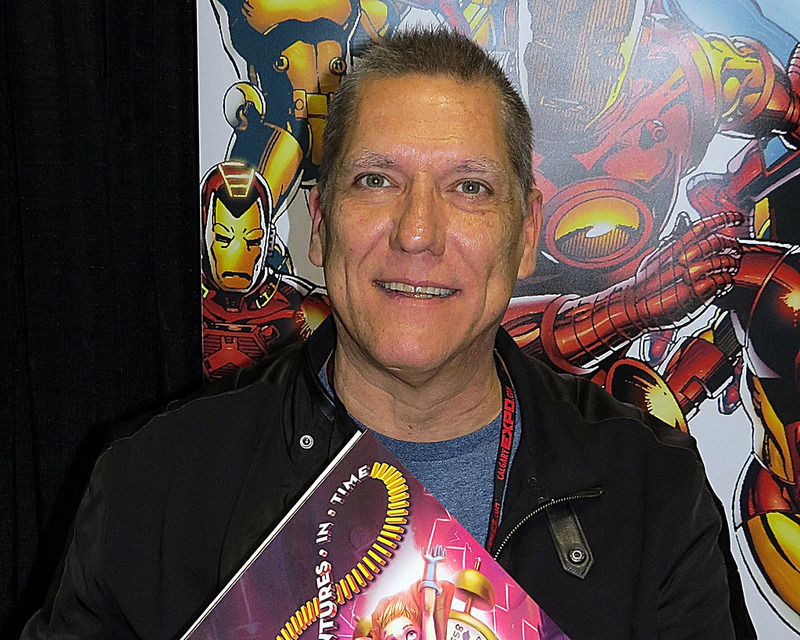 You can also nab yourself a photo op with famed comic-book artist Bob Layton, known for his work on Marvel Comics titles like Iron Man and Hercules. “Guest of honour” Billie Piper of Doctor Who fame is only one of the 60-odd familiar faces from the realms of your favourite movies, TV, comic books and more that will be making the pilgrimage to Ottawa this weekend. Ticket information is available here, and it looks like they might even still need some volunteers. It’s not too late to plan yourself a weekend of superheroic proportions. And of course, don’t forget to stop by the CmdStore booth on your sojourn through all of the magical sights and sounds of the Ottawa Comiccon. Snap a photo and tag @CmdStore on Twitter or @shopcmdstore on Instagram, and we’ll hook you up with a retweet and a follow. Build a giant Thanos when you collect wave two of the Marvel Legends Infinite Avengers! At last, our loves have come along. We were biting our nails waiting for this killer wave of new Marvel Legends figures based on the Avengers, and now they can finally make their way into our paws — and yours! Six-inch versions of Age of Ultron Captain America, Age of Ultron Iron Man Mark 43, Age of Ultron Hulk, Spider-Woman, Helicat and Batroc are up for grabs here, with the ultimate prize to be assembled. That prize, of course, is the formidable Thanos, resplendent in a costume of gold and obsidian. You really can’t sleep on these guys if you’re truly stoked on the Marvel Legends lines, and no collection can be totally complete without them. So get on over to CmdStore.com and order ’em up! And if you grab all six together, you won’t miss out on our irresistible package deal, featuring a special, discounted price. Let’s go. Thanos x Migos is our fantasy “-os” music collab. The toy powers that be have looked upon us in favor. Coming in the third quarter of 2015 is the second wave of the Marvel Legends Infinite six-inch series. The Build-A-Figure character here is Thanos, complete with signature black-and-gold garb. We will be getting our hands on Age of Ultron Captain America, Age of Ultron Iron Man Mark 43, Age of Ultron Hulk, Spider-Woman, Helicat and Batroc. And you can, too! All six of these figures are packaged together as shown below, and combine that with our special pre-order price offer and you can save, save, save! And we’re keepin’ ’em coming. The third wave of the Spider-Man themed Marvel Legends Infinite series, with a Build-A-Figure Hobgoblin, will be arriving next month. Remember not to miss out on the lowered pre-order price by placing your order now! Good things come in sixes. The legendary Iron Man 3, the seventh installment in the Marvel Cinematic Universe, has gone down in film history as one of the sixth-highest-grossing box-office releases of all time. And so naturally, aficionados and aficionadas have clamored to own pieces of this superhero cinematic legacy. Hot Toys have presented a new addition to their unique Diorama 1/6 Scale series, the Hall of Armor (House Party Protocol Version). Tony Stark spearheaded the creation of various super-suits of armor, which he kept in the basement wine cellar of his luxe Malibu mansion before the House Party Protocol took effect. Now you can display your figurines in official, licensed fashion. With the help of LEDs, the Hall lights up in the back and on the ceiling, and on the figure stand as well. Hot Toys Iron Man 1/6 scale figures are compatible with this 15-inch Hall of Armor, and any collection of them won’t be complete without it. And if your Iron Man 3 appetite hasn’t yet been satiated, check out the Diorama Series 1/6 scale workshop accessories set here. Snap them up! The Hall of Armor can be used to authentically store your 1/6 scale Iron Man 3 figures. Sometime after the events with the Avengers conspired, a steely hero-suit of venerable proportions was created by Tony Stark. We’re talking, of course, about the legendary Silver Centurion ensemble, which fans will recognize from the epic struggle between Tony Stark and Aldrich Killian. Tony, with the help of the Silver Centurion’s concealed blade, slices the arm of scheming initiator. We love that the head is sculpted to resemble Robert Downey, Jr. in the film, making the silver and red Enhanced Energy Suit Upgrade detail jump out even more. This figurine is from Hot Toys’ Movie Masterpiece Series and boasts interchangeable battle-damaged chest armor and palms, forearm blades and LED light-up functions, along with 36 points of articulation. Phew. And we’ve got it! A hidden arm blade turned the fate of the skirmish between Tony Stark and Aldrich Killian in The Avengers.